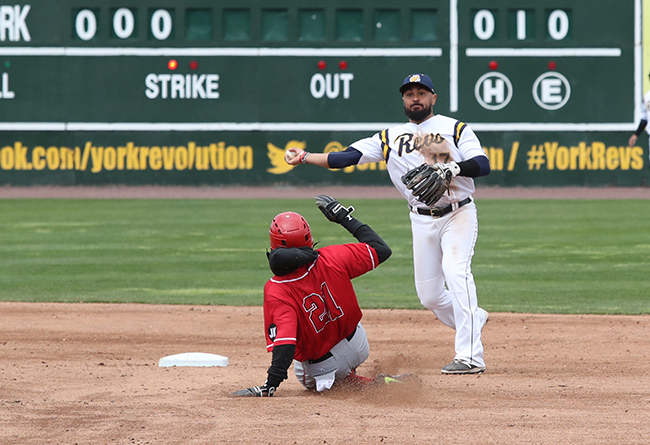 (York, Pa., March 13, 2019) - The York Revolution have re-signed shortstop Ryan Dent for the 2019 season while adding right-handed pitcher Jameson McGrane. The moves were announced by Revs manager Mark Mason live on Tuesday evening’s airing of “Revs Hot Stove Weekly presented by Shipley Energy” on SportsRadio 1350 WOYK. Dent returns for his third season with the club as one of the Atlantic League’s best shortstops. He was a key piece of the Revs 2017 Atlantic League championship squad during his first season in York, batting .266 with five home runs, 21 doubles, and 46 RBI. He also handled the final defensive outs of the wins that clinched the team’s playoff berth, division series title, and championship victory. Dent followed his strong first season in York by batting a career best .279 with a career-high 16 home runs and 59 RBI in 2018. Dent holds franchise records for home runs and RBI by a shortstop and has started 200 games at shortstop in his York career, second most in franchise history. Dent spent his first eight pro seasons in the Boston Red Sox organization and two more with the Chicago Cubs, reaching the Triple-A level with both clubs. The 13-year pro was a first round selection (62nd overall) of the Red Sox in the 2007 amateur draft and is a career .240 hitter with 58 home runs, 368 RBI, and 107 stolen bases. The Long Beach, CA, native was named the Red Sox Minor League Defensive Player of the Year in his third pro season in 2009. He will celebrate his 30th birthday this Friday. McGrane comes to York for his first Atlantic League season after previously pitching in the Miami Marlins farm system. A 26-year-old from Potomac, MD, the 6-foot-4 right-hander began the 2018 season with Florence of the Frontier League, where he allowed just two hits and no earned runs in 9.1 innings while striking out 19 batters and posting a pair of saves. That dominant effort earned him a contract with the Marlins, where he spent time at four levels, combining to go 4-0 with four saves, a 2.30 ERA, 39 strikeouts, and just 19 hits in 27.1 innings. McGrane went 3-0 with a 1.52 ERA for Batavia of the New York-Penn League and also picked up a victory for Jupiter in the High-A Florida State League. The Revs now have 17 players under contract for the 2019 season, with more signings set to be announced live during the next episode of “Revs Hot Stove Weekly presented by Shipley Energy,” Tuesday, March 19, at 6:30 p.m., immediately following “The Baltimore Baseball Show” on SportsRadio 1350, woyk1350.com, and The New WOYK app.